The TLE of the five CubeSats recently launched from ISS are now available with the NORAD registration numbers 1998-067-CN, CP, CQ, CR, CS. 1998 ? Yes as NORAD considers they are parts of the ISS, the first module of which, Zarya, was launched on November 20th 1998 and got the NORAD registration number 1998-067-A. (J-P/F5YG wrote on amsat-bb) Yesterday evening (Western Europe, around 2130 UTC), I noticed that FITSAT-1 was already about 4 mn before the ISS predictions as this one modified altitude (higher). With a max. elevation angle of 83 deg., we received the 437.250 MHz beacon loud and clear. We-Wish, RAIKO, FITSat-1, F1 and TechEdSat. 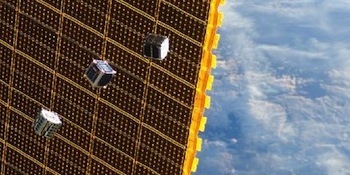 This entry was posted in Satellite and tagged Cubesats, F1, Fitsat-1, TechEdSat, We-Wish by PE0SAT. Bookmark the permalink.